Sabbath Walk: I Surrender More? KEY POINT: When Jesus empties himself, he is emptying not his attribute but surrendering his self-will in favour of God's will. One of the most popular hymns in many churches is the classic, "I Surrender All" written by Judson W. Van deVenter (1855-1939). Trained in the arts as well as 17 different musical instruments, deVenter gets involved in all things music and arts, whether traveling or ministering. Having many different talents, like many, he struggles with making choices on what best to do with his own life. It is not a situation where he has nothing to do, or does not know what to do. He simply is stuck between the love of teaching versus the desire to be a part of an evangelistic team. No matter what decision he makes, there is always a pro and con. Stay behind and teach, and bless the students inside. Go out and evangelize with the team and he can bless people outside. Both decisions are good. Which then is God's will for him? This week, I reflect on the common challenge for Christians. How can we truly surrender our all? For that, we will learn from the life of Jesus, and how he surrenders all. Philippians 2:7 has often been highlighted for anyone studying Christology and the doctrines related to Christ. The words "made himself nothing" can also be translated as "emptied himself." The verb "kenoo" (kenovw) means 'empty,' 'void,' 'make nothing.' Is "emptying" about becoming like the person who falls short of God's standards? This makes the verb very problematic for theology students when they study kenosis. What does it mean when Christ empties himself? Is it the giving up of his OmniPotence (All-Power), his OmniScience (All-Knowing), and his OmniPresence (All-Present)? Is it making himself equal to man completely? Is it the sacrifice of his complete self-will in favour of God's total will? If we answer yes to the first question, it will mean that for a period of time, Christ is not divine. For example, one place that scholars have argued is in Mark 13:32, where Christ acknowledges that no one, including himself knows about when exactly the last day is. That represents a temporary giving up of his divine attributes. However, if that is true, then it will deny the very being of God! How can one deny himself the very essential attribute that defines him? Surely not. Emptying oneself is not exactly giving up of his divinity. Jesus can be divine and still human in his choice making. So, we can say that the idea of 'kenosis' is not about Jesus giving up divinity. Choosing not to exercise divine attributes does not mean one has to give up the attribute altogether. B) Making himself fully equal to man? This brings us to the next question. Is Jesus by giving up his own will, becoming more like man rather than God? It is possible, but that will bring problems with regards to how we see Jesus. Is Jesus at that time more human and less divine? How can a person be subdivided into different spiritual stages? Surely, it will bring about all kinds of confusion about the Person of Jesus. No. When Jesus empties himself, he is not emptying himself of his divine attributes. Neither is he giving up his humanity. He is giving up something else. More particularly, he is giving up self-will. When Christ comes to earth and becomes human, he is already 100% human. He is already fully equal to man. He does not need any more addition or subtraction to make himself more or less like man. He is already fully human. He does not need to give up more of his human being in order to be more human. So if Jesus is fully divine, and also fully human, what then is Christ emptying himself of? The answer: His will. Jesus submits himself to the Father's will, preferring to obey God rather than to give in to any other way. It is a deliberate denial of self. It is an absolute determination to put God first. It is a humble acknowledgement that doing God's will is primary, and all other things are secondary. By a wide margin. Note in Philippians 2:7 where Paul writes of Christ as one who "taking the very nature of a servant," as an intentional choice. He chooses to be a servant even when he is a king. He chooses to take the lowly road even when he is fully eligible to take the royal path. He chooses to adopt the nature of a servant, to serve rather than to be served. Paul adds, "being made in human likeness" as a reference to the possibility of choice. Jesus gets to choose. Jesus gets to decide what needs to be done. He is not forced. No one is pointing a gun at his head to tell him what to do or what not to do. Jesus chooses freely, willingly, and obediently. That is the essence of surrender! It is the offering up of our wills in favour of God's will that is the essence of surrender. In overcoming death, Christ has broken the power of sin. In freely choosing God's will, Jesus has done more than what the righteous Job has done. In obeying God completely, Jesus has defeated the enemy completely. 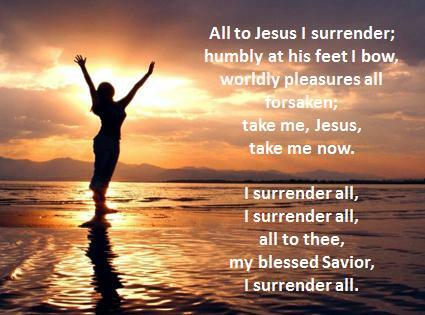 The essence of surrender is about fully yielding our own wills and to fully embrace God's will. The writer, Elisabeth Elliot reminds us that "One does not surrender a life in an instant. That which is lifelong can only be surrendered in a lifetime." True indeed. We cannot say "I Surrender All" at an instant, for life is not an instant frame. All of us can take snapshots of our lives, both physical and spiritual. We can remember only the good parts and forget about the bad. The life of surrender is a lifelong process. There are no short cuts to surrendering. It has to be done constantly, freely, willingly, and obediently. Judson deVenter, the hymn writer of "I Surrender All," struggled with the decision between teaching vs evangelism for at least five years. He could have screamed out surrender right at the beginning, but it will not be authentic. He could have waited and not make any commitment, so that he can change his mind anytime, but that will not satisfy his inner being. Instead, he struggled, he prayed, he pondered, and on a daily basis continued to be faithful with his skills and talents. Then, as he was conducting a meeting at East Palestine, Ohio, something dawned on him that only one thing is needed: surrender. Surrender the decision to God. Surrender the consequences to God. Surrender himself to God. The words become a song. The song becomes a classic. The classic becomes God's reminder to many believers, that when we surrender all, we are acknowledging that God knows best. My friends. Surrender is not a one time decision made quickly. It is a series of decisions made over a period of time. Some may surrender sooner, and others later. What is most liberating is that God is patient. God is willing to wait for us to choose him in everything, and in all things. For in doing so, we will soon realize that surrendering ourselves to God is not about emptying ourselves of our future. It is about putting our lives fully in God who knows our future. When we are in the arms of the perfect God, we are in the arms of one who loves us and gives himself for us, through his great love in Jesus. If you have trouble singing "I Surrender All," why not try "I Surrender More" for now. At some point of time, God will reward us, with the ability and the faith to sing "I Surrender All." Freely, obediently, and willingly. Are you stuck in the middle between choices like a rock and a hard place? If you are, surrender that choice to God, and pray that whatever choice you make, God's will be your focus. Once you have made the choice, let that choice lead you to greater freedom, greater obedience, and greater capacity to say: "God's will be done in all of my life."